JOHANNESBURG (AFP) - Diego Maradona and Lionel Messi arrived in Johannesburg on Saturday with the Argentina squad to prepare for a World Cup they are among the favourites to win. Clear skies and cool early morning autumn conditions greeted the third team to land in South Africa after Asia powerhouse Australia and five-time champions Brazil for the June 11-July 11 international football showcase featuring 32 national teams. After a brief session with select TV crews and photographers, coach Maradona, Barcelona superstar Messi and a mix of foreign-based and domestic stars left in a brightly painted luxury coach for their Pretoria base. 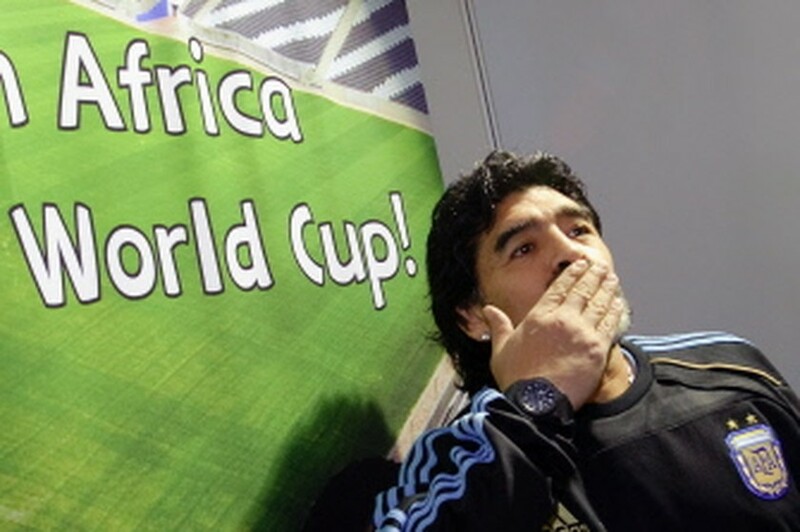 Football legend Maradona - who is bidding to add World Cup glory as coach to the 1986 trophy he won as a player - drew huge crowds wherever he went during a pre-tournament inspection visit to South Africa and is set to be among the most colourful characters at the first African World Cup. The 49-year-old considered by many critics the greatest footballer the game has seen created headlines this week by demanding a special heated loo seat and promising to run naked through central Buenos Aires if he lifts the Cup. A 450-dollar heated loo seat with a warm-air blow dryer and front and rear bidet wands was ordered for the room where Maradona will stay, South African reports said. And the naked-run boast came during an Argentine radio show the day after his team outclassed Canada 5-0 in a warm-up for World Cup Group B fixtures against Nigeria, South Korea and Greece. He captained his country to World Cup glory in 1986 - the tournament in which he scored the 'Hand of God' goal against England - but had to be satisfied with a runners-up medal four years later. Maradona, banned during the 1994 World Cup after testing positive for the banned substance ephedrine, succeeded Alfio Basile as coach halfway through a faltering Argentine campaign to qualify for the 2010 World Cup. The 49-year-old also battled to find a winning formula and Argentina secured a place in South Africa only in the final round with a 1-0 victory over Uruguay in Montevideo. Argentina fell 2-1 away to European champions Spain and triumphed 1-0 away to 2006 World Cup hosts and bronze medalists Germany in high-profile warm-up matches. But Maradona has yet to convince sections of the media he can take his country to a third title after winning at home in 1978 and in Mexico eight years later. Criticisms include favouring an overly cautious system that includes only two strikers, usually Messi and Gonzalo Higuain, while leaving Champions League hero Diego Milito, Carlos Tevez and son-in-law Sergio Aguero on the bench, though Maradona did suggest after the mauling of Canada that he could deploy three strikers. A huge challenge facing Maradona is to coax the best out of Messi, such a scourge to defenders when in the red and blue of Barcelona but too often ineffective when playing for Albiceleste (white and sky blue). Denmark, Group E contenders with Netherlands, Cameroon and Japan, landed at Johannesburg international airport less than an hour after the South Americans.